Interlube International holds exclusive rights to Surface Improving Eutectic additives. Interlube's Eutectic additives contained in Opti products work to reduce friction, heat and wear associated with the severe demands placed on today's power equipment, improving performance and extending engine life. The following explains the fundamentals of lubrication along with the three generations of oils. Opti oil's Surface Improving Eutectic additive is explained as the third generation of oil. Although a lubricant must perform many functions, its most important job is to protect working components by reducing friction. To analyze this critical aspect of lubrication, lets take a look at what is being lubricated and how different lubricants approach the task. All machined metal surfaces have a surprising amount of surface roughness (pictured right). The fundamental purpose of lubrication is to separate metal surfaces. The microscopic peaks and valleys in all finished components make surface separation more difficult. An oil layer with a thickness of at least twice the height of the tallest peak must be maintained in order to eliminate metal-to-metal contact. If complete surface separation is achieved, the resulting condition is called hydrodynamic lubrication. Hydrodynamic lubrication is not difficult to achieve provided a constant speed with no load is maintained. Unfortunately, rarely does power equipment run at a constant speed with no load. Under a loaded condition the surfaces can be forced together resulting in metal-to-metal contact, and of course, wear. To assist in the formation and maintenance of hydrodynamic conditions, additives are used in lubricant formulation to smooth out surface roughness. All current oil formulations include some method of accelerating surface improvement. Separating oils by their built-in surface improvement process yields 3 oil classifications or "generations", as they are commonly called. These lubricants utilize an abrasive wear concept that allows for surface clashing and smoothening through a sacrificial process of removing surface material. In many conventional lubricant applications, E.P. (extreme pressure) additives are used to promote the abrasion process through chemical reaction. These conventional oils have been in wide use since the 1920's. Conventional oils with EP-additives form metallic salt layers at the mating surfaces chemical reaction, which prevent seizing of the surfaces. 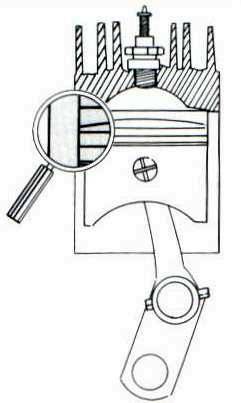 The built-up film is constantly renewed, but causes continuous wear. The surfaces slowly etch away at each other until a smoother, yet somewhat crude surface results. This is a sacrificial process that results in small metal particles being removed from the component and can contaminate the oil film. In the late 1940's, solid additives were first introduced to many specialty oil applications. These solid additives such as graphite, molybdenum (pictured left), silicone, Teflon, etc., work under the concept of coating the contact surfaces to protect against surface clashing. Lubricants containing solid particles form under pressure a protective layer with a low friction value. In this case material is not removed, rather deposited. Solid additives are deposited in the valleys to create a smoother surface. They are designed to protect against metal contact by coming between two peaks at the moment of contact. The peak will deform, rather than weld and break. 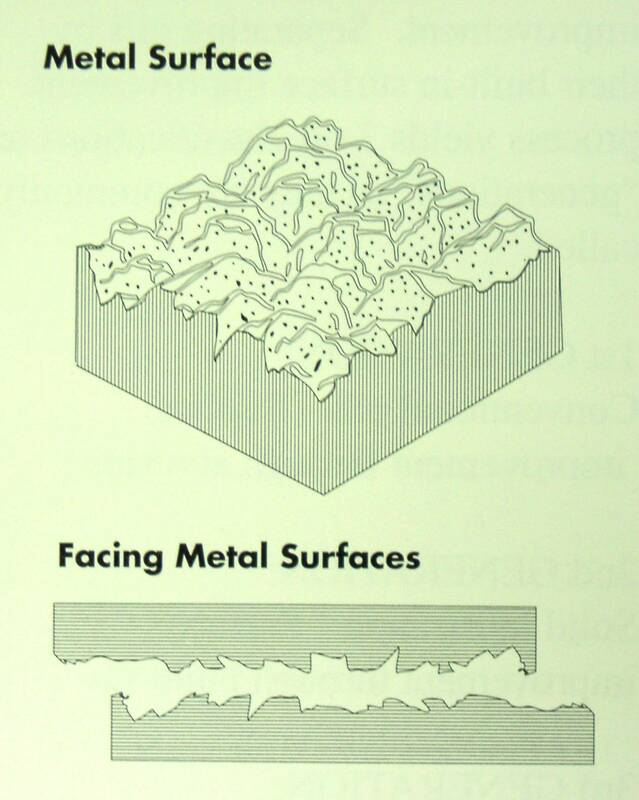 The solid additive flake will shear, allowing the two deformed peaks to pass by each other with limited damage. Solid additives provide smoother surface area through a less sacrificial process. However, particle size and concentration makes it statistically impossible for an additive flake to be present each time two peaks come together. Some abrasive wear does occur. In the 1970's, a 3rd generation of oil technology was developed and further enhanced in the late 1980's. This technology utilizes a eutectic reaction that restructures contact points without removing or adding material. When metal to metal contact occurs, extremely high but localized temperatures cause a reaction between the additives and the mother material. Although highlighted here, these localized temperatures occur with all oil technologies, but only eutectic additives utilize these conditions to restructure the metal surface. The metal peaks become soft and are deformed by the pressure. 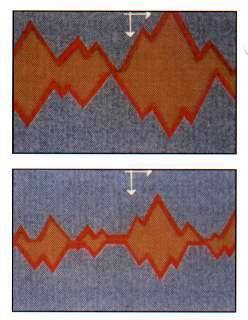 Repeated deformation restructures the surfaces to their optimum smoothness until no peaks are clashing. Additives then become dormant from lack of the localized high temperatures, returning the metal to its original density. Photographic enlargements quickly illustrate the results of the three generations of lubricants. 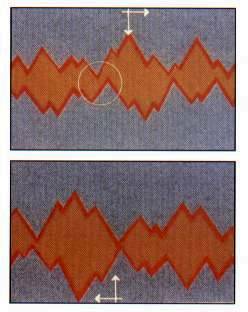 These photos show magnified views of contact surfaces before and after break-in. Each was using the specified lubricant, all running under identical load, ambient temperature, time period, speed, etc. This picture shows a newly finished metal surface prior to break-in. 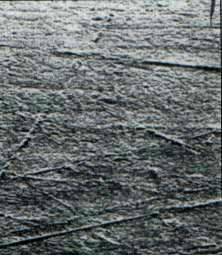 To the naked eye, this surface would appear like glass ; however, through magnification we can see it is actually covered with microscopic peaks and valleys. This picture shows a cylinder surface after break-in with 1st generation lubricant. 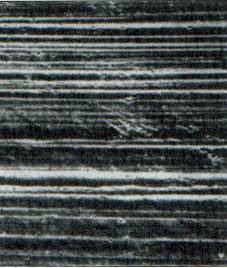 The first oils simply formed a liquid cushion between moving parts and allowed microscopic surface roughness to slowly smooth through abrasion. Later, chemicals were added which formed metallic salt layers on the sliding surfaces to slowly wear away surface irregularities. 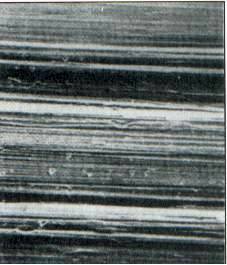 This picture shows a cylinder surface after break-in with solid lubricant. 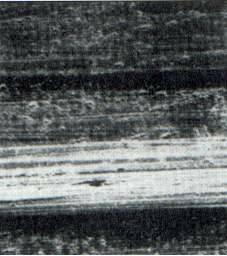 The second generation oil development was a lubricating medium containing graphite, molybdenum, Teflon or other solid additives that formed a protective layer under pressure and filled in microscopic pits and valleys to form a smooth sliding surface. Instead of wearing away metal, they built up on the metal surface. This process involves neither abrasion nor build-up. It produces an action that causes the metal surfaces to restructure. The metal deforms and rapidly produces super-smooth, hardened, sliding surfaces. The harder the engine is run, the more effective the lubricant becomes.